Carrot Beetroot Stir Fry(Mezhukkupuratti) is one of my favorite stir fry from school days. I could finish off a bowl of rice just like that with this stir fry and some curd/yogurt. I love the color of carrot beetroot stir fry when combines with yogurt, transformation from deep red to pretty pink and they taste marvelous!!!! I would always suggest to use fresh beetroots as they are soft and tender. They are very easy to slice and dice and cooks up quick unlike aged ones which are hard to cut, takes longer to cook. 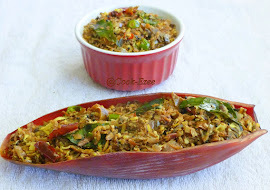 So make this easy breezy stir fry for your lunch/dinner to serve with Rice/Roti!!!! Heat a Kadai, pour coconut Oil/Coconut Oil. Add onions and green chilies and saute till onion turns translucent. Add few curry leaves and saute for few seconds. Add salt, turmeric powder and stir to mix and combine. Add the chopped carrot and beetroot and stir well to combine. Cover with the lid and let it cook in low-medium flame for five-seven minutes stirring one or two times in between. Open the lid and check if beetroot is cooked enough, if not cover and cook for another three-five minutes. If there is more moisture set the heat on high and stir for a minute or two. Turn off the heat and drizzle ½ tsp of coconut oil(only if using coocnut oil, dont add oil if you are using normal oil) and few curry leaves and keep it covered until ready to serve. 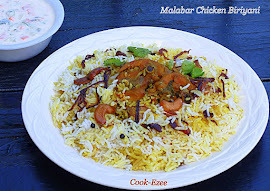 Hi I found this blog through Manju, and like you, I'm also food lover. I would love for you to follow each other, and you got some good recipe to try. Thank you! Very healthy dish, I like the way you have sliced the vegetables.. Very catchy and healthy side dish..can have happily with some rice. very very healthy and delicious stir fry :) looks so yummy and appealing !! such a colorful and healthy veg, nice! Wow...love it to the core..best for healthy freaks! My all time favorite, very healthy too. Very colourful, Nice side dish for rice. Colourfull and healthy stir fry. very healthy n need sum rotis..
Adipoli, my kids love it. I have made carrot thoran n beetroot thoran individually...never tried them together :-) Ithu kollalo...shud try son. Happy Diwali in advance to you n ur family Prathibha , have lots of fun! Love the way you have chopped. Happy pongal.